We seem to be having a bit of a family-fest in our house at the moment. Last week my gorgeous sister came to stay, on Friday my parents came for the day to pick her up, and then yesterday my in-laws arrived for a week (staying in a holiday cottage - more on that later). They leave on Saturday, which is the same day that Andy goes away for a week, and then my parents are returning for the day on Sunday to drop off their aged Springer Spaniel who is coming for her holidays while they jet off to sunnier climes. My sister may return shortly too - she is homeless at the moment having just bought a house with her boyfriend but the contract on their flat ran out before the moving in date for their house. My family is the most important thing in my life - starting with my own little group (Andy, Grace, Ruth), and then widening out to my parents, sister, 2 elderly grandmothers, various aunts, uncles and 1 cousin, Andy's family, and friends who are so close that they may as well be family. I wish that my family lived nearer (my parents are 90 miles away in Leicestershire, and my sister lives in Newcastle), but we see each other fairly frequently and talk on the phone (my sis and I also text each other many times a day). Sometimes I feel I'd like to move away from Cheltenham to be nearer them all, but we are tied here forever due to Andy's job. There are worse places to live - Cheltenham is a beautiful town, and the countryside is never very far away. We have wonderful friends here, our allotment, a great school, a lovely house (and hopefully soon another even lovelier one! ), we are within walking distance of the town centre, parks, even countryside if you don't mind a steep climb! If my family could move within a 30 mile radius it would be perfect. So, my week with my sis went quickly. She is 5 years younger than me, and we hated each other as children, but she is the now person who knows me best (after Andy), and is one of the few people who can make me laugh until the tears pour down my cheeks. We had a lovely time pottering around town, going out for breakfast one day, lunch the next, trying out make up and perfume, chilling at home with wine in the garden at 4 in the afternoon, making a party tea for the girls after school one day, watching Family Guy, discussing our innermost secrets, sticking buttons on shoes. It is real therapy when we get together, and I think we were both in need of fun as we have both had a rather hectic and stressful time recently. I feel refreshed and renewed and raring to go, and hope she does too. One of the places that we visited was the Cath Kidston shop here in Cheltenham, which has started to sell a few vintage bits and bobs. 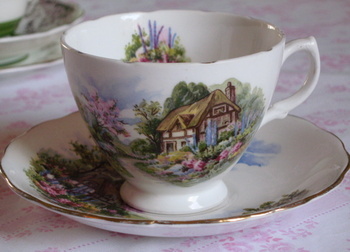 I was amazed to see the very same Queen Anne tea set that I have listed on my website for sale for more than double the price I have listed it for - the cake plate, sugar bowl and milk jug alone were going for £30. 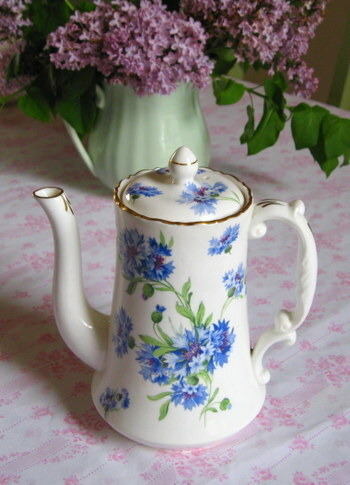 They also had a pretty Royal Vale trio for £30 in the same pattern as one I have on the website for a third the price. I can't believe that people are prepared to pay such over-inflated prices just because it came from the Cath shop. One of the other things I spent last week doing was wiping blood from the walls. Bodie is the happiest dog in the whole world, but unfortunately that means he wags his tail a lot. 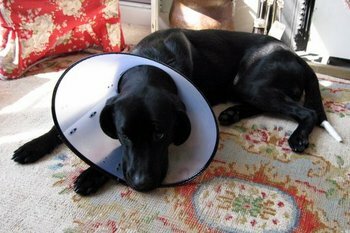 He split the end whilst doing some very vigorous wagging and then proceeded to splatter blood all over the walls in a 50cm swathe which spread all over the house. The kitchen looked like it had been the scene of a massacre of very short people, and my top tip to you all is to buy wipe-clean wallpaper (fortunately the green wallpaper in my hall is wipe-clean, which is just as well - red and green should never be seen, apparently!). So, several rude words later, this is what he looks like. I did some emergency veterinary nursing and bandaged the end of his tail with some tubular finger bandage and some micropore tape. 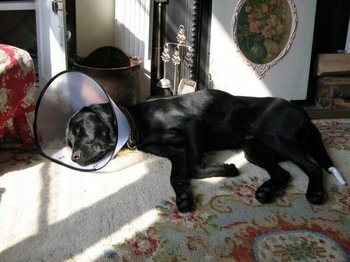 The collar is to stop him pulling the bandage off. Does he look like a happy dog to you? And now?! We took the collar off once he forgot about his tail (he is a dog of very little brain), and took him to Andy's parents' holiday cottage. They have been coming to the same cottage for the last 13 years, twice a year, and it is like home from home now. It is a converted barn and looks out over the valley to the Malverns (couldn't get a good picture due to the rain and fog, but will try later in the week), with acres of land for walking. There is a pond at the foot of the hill and we decided it was time that Bodie learnt to swim. 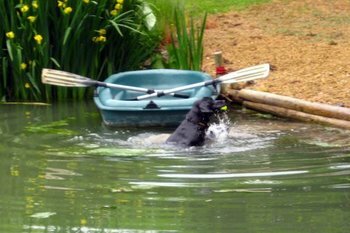 He is a labrador after all, and loves retrieving his ball, but water seems to worry him slightly. He doesn't like getting his feet wet in puddles so getting him into the pond was a major effort. We will persevere all week, but this wasn't bad for a first effort! One of the benefits of having a husband who travels through work is that he brings home little gifts to make up for leaving me to sleep in the bed with clean sheets and no snoring, watching my programmes on the tv in peace, reading my book for more than 10 minutes in bed without being asked if I am turning the light out yet... (I do miss him when he's not here,, but the first night is always bliss!). 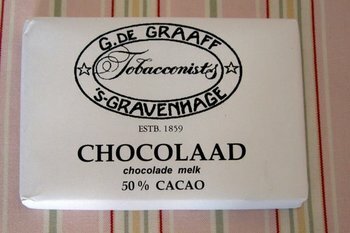 This was this week's offering - a bar of expensive chocolate. It is probably the nicest chocolate I have ever tasted and I don't want it to ever end. Normally I wolf it down in one go, but I am savouring this one! Can't wait for the next trip!! I hope you are all having a lovely long weekend and half term (if it applies to you). If not, I hope you are having fun whatever you are doing. Thank you all for your lovely comments - I am trying to go around all your blogs to leave reciprocal comments, so bear with me! Well, actually a fortnight really. Last week I had a school trip to Cattle Country (not many cattle, but a nice day out - if a little stressful due to the over-enthusiasm of my charge), 2 days of interviewing for a new headteacher (which as Chair of Governors required much more from me than I thought), but then last Friday it was chill out time at the Malvern Spring Show. I went with Sophie straight after dropping the girls at school and we had a really self indulgent day browsing through show gardens, plant stalls, shopping opportunities aplenty, and a couple of ciders in the sun at lunchtime. We left at 6pm laden with plants and the biggest basket in the world that Sophie bought but which we both carried around for the last 2 hours to many laughs from bystanders. I was restrained in the plant department but got heaps of new ideas for my potential new garden (if we sell our house), and I did come home with the most amazing scented geraniums - rose, lemon, nutmeg and lemon sherbert. I know the leaves can be used to flavour sugar and other things so I am going to research that and will keep you posted! 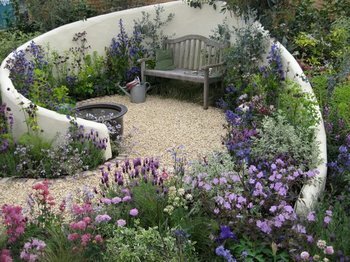 This was my favourite show garden - I can just see myself sitting here with a gin and tonic! I also liked this fairytale one. Again, note the bench. Essential. Purple and blue were obviously the in colours this year - they were everywhere. Chelsea starts tomorrow night so it will be interesting to see if that is the case there too. This one even had a little steam train in it, but unfortunately my picture of it has someone's arm in it too. 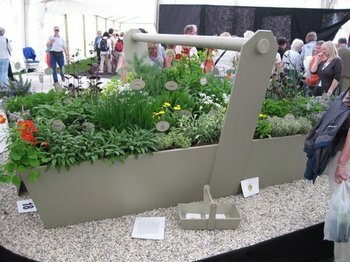 This was in the floral marquee and was a huge trug based on the small one in the foreground. It had every herb under the sun in it and was my favourite display. 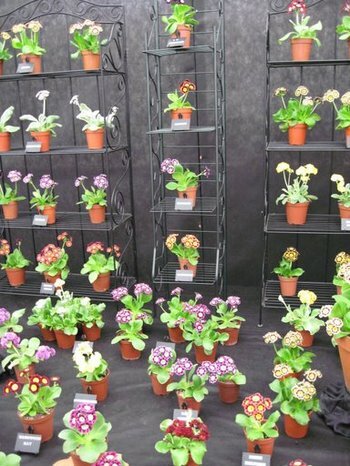 I also liked the Auriculas against the black - really striking. So, onto this week...Monday, Wednesday, Friday and this morning were spent temping in the office where I worked before I had the girls, which is something I have done from time to time over the last 6 years, and is good for some quick and easy cash, and then Tuesday and Thursday were spent interviewing for new teachers in Reception and Year 1. I am getting to be a dab hand at interviewing, what with all this practice! I have also been out every night except last night (allotment, pub, book club, ladies night at school), so I am really looking forward to a quiet couple of days to recover. This may also explain my lack of blogging - I have barely had time to check emails this week, let alone thrill you all with tales and pictures!! 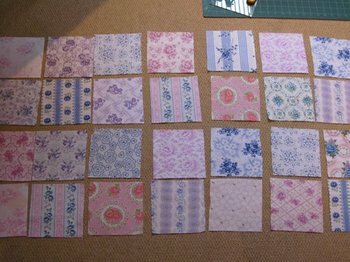 I have actually managed to create some things too (last week), and I finally got round to something that I have needed for ages. I love sitting up in bed reading, but it has to be bolt upright otherwise I fall asleep, but my shoulders get cold so I made a patchwork mini quilt/shawl to throw around my shoulders. Unfortunately it happened to be just before the hottest day of the year and I haven't had chance to use it yet. Typical. Still, maybe tonight's the night as it is freezing here today. I also made a flower brooch and some card decorations out of some fibres I bought at Art in Action near Oxford 2 years ago. It is a show where crafts people demonstrate their art, and is very inspiring. My friends' husband displays his students cabinetry there sometimes and got us tickets (I am hoping there may be some this year as it was fab - hint hint Stacey!). 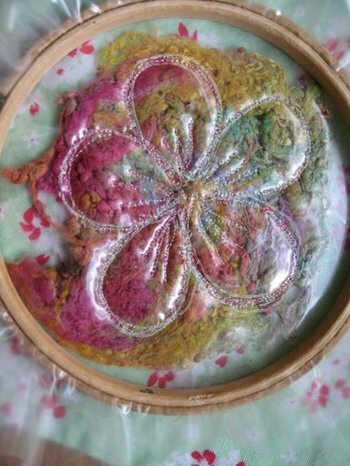 I used soluble plastic and sandwiched the fibres in between before machine sewing round the outline in silver thread. You then soak the plastic away and Bob's your uncle! My camera is playing up and I haven't got a photo of the after, but I am very pleased with it. I am often quite critical about my sewing, but I was really pleased with how this one turned out. I'll try to get a good pic soon. I have a much less stressful week coming up. My sister is coming to stay on Monday for the week, and is coming on the Reception class school trip on Tuesday to the Farm Park (she must be mad!). We are then spending the rest of the week pottering, shopping, chatting and sorting out my stock. She has a lovely friend who has offered to sell my stock for me. She has had a few very successful parties before and says she loves doing it, so is going to try to sell as much as possible over the next few weeks. I honestly don't think I have the time to devote to it at the moment so this is great. I just need someone to volunteer to run the website now as well (fancy that too, Lucy?!! ), and I can run my empire from the allotment kitchen!! Sorry I haven't been leaving comments on all your posts - I turn away for a week and Bloglines has 350+ entries for me to work through. I try to read them all so it takes a while, but I am slowly catching up. I am with you all in spirit though!! Hope you are all having a lovely weekend. Where has the sun gone? I may even light the fire tonight! I have 3 logs left and a bit of coal so I feel I should use it up now ready for next season. Whatever you are all up to I hope it is fun. I am back in blogging mode - 2 posts in a week! I finally cleared my bloglines backlog (although when I checked earlier it was back up to 25 already), and it is so nice to be back in contact with you all. Thank you for all your lovely messages welcoming me back - it is a bit nerve-wracking getting back into it as I wondered if you would all shun me for having deserted you for so long! I had my first afternoon working in Ruth's class (Year 1) today which was fun, although I am still picking clay from underneath my finger nails. I am specifically helping with a little boy who has some fairly challenging behaviour, but I am also supporting the rest of the class. We are off on the class trip to 'Cattle Country' on Tuesday for the day, and I am keeping my fingers crossed for nice weather. It is only voluntary but it is brilliant experience and will help me either get a job or at least get on the NVQ course in September. Ruth seems to forget I'm there, and she is used to me being at school as I helped in her class last year too (I have done Reception class for over 3 years now). I am waiting for the weather to pick up so I can go and check out my seeds at the allotment. 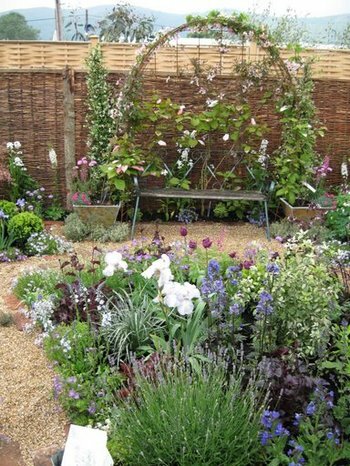 There should be at least a few left after the birds and the mice have their fill - I always sow heaps with them in mind, and I am sure there will be weeds to deal with too. 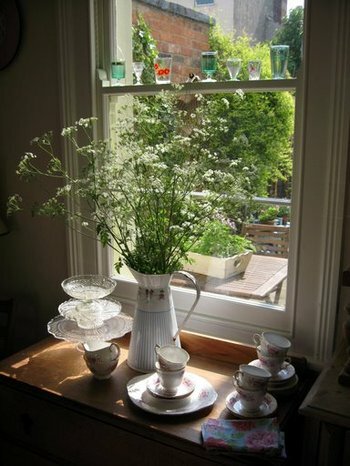 We have had 2 viewings on the house and have another one on Saturday so tomorrow will be spent tidying up - again. It seems to be never-ending. I have to admit I quite like my new stream-lined house, but you could still hardly class it as minimalist! In a bid to clear the clutter I am putting some of my treasures on my website over the next week or two. I do find it hard to part with them all, but it does mean that I am creating space and cash to do it all again! I spent this morning taking photos of china in the brief moments that the sun shined, and have uploaded some of them. 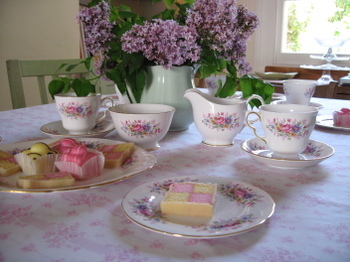 Please pop over to www.pinkgreencreations.com and see if anything takes your fancy. Don't forget that there is always free postage and packing within the UK. 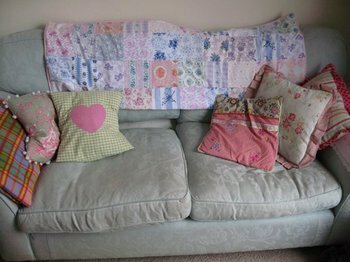 I am planning to put some more bits and bobs on, including some fabric (if I can bear to part with it) shortly. My website has unfortunately but unavoidably taken a backseat over the last few months, but I am hoping to kick start it again and get change a few things too along the way. I have so many ideas in my head, but finding the time to translate them onto fabric and then cyberspace is proving tricky. I will persevere though. 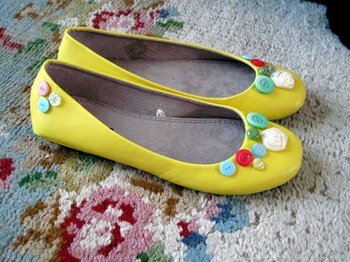 I love to sew, but I also love shopping, so I am going to be adding more vintage bits too. I have a friend who runs a jewellery business and I am going to get some sparkly bits from her to add to it too. It is all exciting, and I am fired up with enthusiasm again. Watch this space!!! I must send a great big thank you to Driftwood for her amazing rhubarb cake recipe - I may never make another sort again. It was delicious (eaten before I could get the camera out! 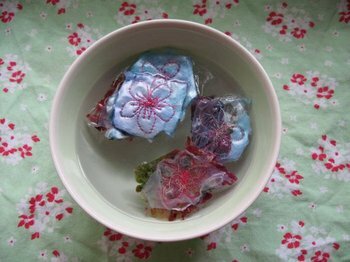 ), and was a fab way of using up some of the mass of rhubarb that we have at the allotment. Sophie and I both pick heaps every time we go, but we can't keep on top of it all! I used to love dipping a stalk of rhubarb into an egg cup of sugar when I was a child, but my girls aren't keen. They eat most things spicy or strong tasting, but they aren't keen on sour. Andy and I are doing our best to plough through it all and I am going to give some away to friends (not on the blog though - it doesn't travel well!). I haven't forgotten about my pay it forward pledge, and I will endeavour to get something out soon. Next week may not be the week, but hopefully it will be in the not too distant future! 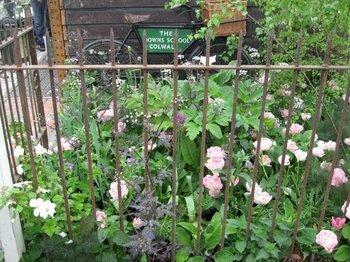 Now I'm not in paid employment at school I am back as Chair of Governors (I couldn't do both at the same time), and I am involved in interviews next Weds and Thurs, and then on Friday Sophie and I are going to the Malvern Spring Gardening Show. I went once with Andy and the girls and it was fab, so I am really excited about going again (this time without children so I can really explore the floral marquee without being covered in ice cream, as I was last time!). So, what with the school trip on Tuesday, next week is a write-off! Hope you are all sunny, cheerful, and looking forward to the long weekend (for those of you in the UK), and the normal weekend (for the rest of you! ).